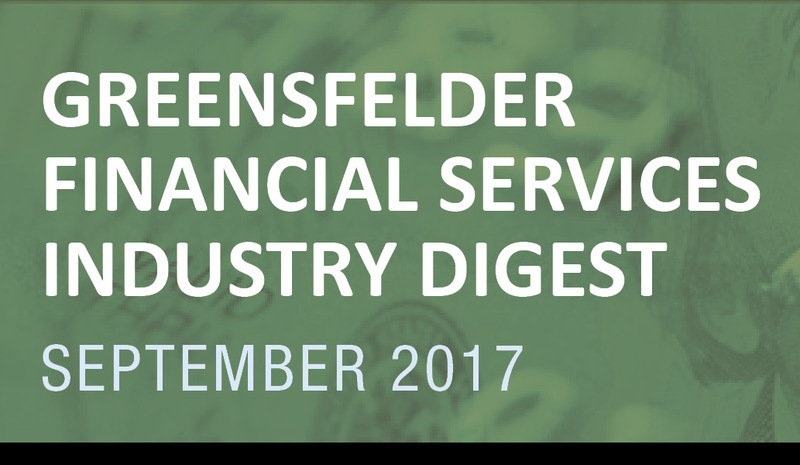 Welcome to Greensfelder's Financial Services Industry Digest. If you have any questions, please contact your regular Greensfelder attorney or any member of our Securities & Financial Services industry group. Sign up for the Securities list to make sure you are included in the next digest email! DOL Fiduciary Delay: The Department of Labor proposed to delay the applicability date of the fiduciary rule’s remaining prohibited transaction exemptions for 18 months, from Jan. 1, 2018, to July 1, 2019. Public comments on this delay may be submitted until Sept. 15, 2018. The rule proposal also announced that the DOL anticipates proposing “in the near future a new and more streamlined class exemption built in large part on recent innovations in the financial services industry.” Presumably this is a reference to clean shares, which were the subject of several questions in the DOL’s Request for Information published in July. The rule proposal also reiterated the DOL’s plan to work with the Securities and Exchange Commission on the appropriate standard. BIC Arbitration Provision: The DOL also released a Field Assistance Bulletin indicating that it would not enforce the class action waiver prohibition in the Best Interest Contract and Principal Transaction exemptions. The bulletin followed the DOL announcing that the class action waiver provision would “likely be mooted in the near future” in a letter from the Department of Justice to the judge presiding over Thrivent’s challenge to the class action waiver prohibition. More Fiduciary Delay: Considering what happened back in the spring between the proposed delay rule and the final delay rule, it is worth noting that the delay proposal also requests comment on several other delay structures: (1) a period of time after an event in the future, e.g. a 12-month delay after the DOL concludes its rule review; (2) a combination of the time certain and defined event possibilities, e.g. the earlier (or later) of the expiration of 18 months or 12 months after the completion of the rule review; and (3) conditioning the delay on the behavior of the financial institution, e.g. the Jan. 1 date is only delayed for those companies who can demonstrate that they are seeking to implement clean shares. The DOL suggested that this third alternative seems “more relevant” to the development of more streamlined exemption approaches than in the context of a delay, but nonetheless requested comment on it. Full Commission? : President Donald Trump officially nominated Robert Jackson, currently a Columbia University law professor and a former senior advisor at the Treasury Department, to fill Mary Jo White’s seat at the SEC. Trump previously nominated Hester Peirce for the other open Commissioner spot. If both are confirmed, the SEC would have five commissioners for the first time since 2015 (although Commissioner Kara Stein’s term expired earlier this summer). Hurricane Harvey (and Irma): In the wake of Hurricane Harvey, FINRA issued a notice to provide guidance to members affected by the storm, including information on how to handle emergency office relocations, extensions for filing deadlines, communications with customers, continuing education requirements, and other matters. The SEC issued a press release that it was monitoring the impact of Hurricane Harvey on investors and capital markets and that it would evaluate possible relief from filing deadlines and other regulatory requirements. The agency also noted it would be watching for storm-related securities scams and prosecuting those matters accordingly. Both FINRA and NASAA issued investor alerts on spotting scams in the wake of Hurricane Harvey. Cybersecurity Focus: The Office of Compliance Inspections and Examinations released Observations from Phase 2 of its cybersecurity focus. The Phase 2 examination involved more validation and testing of procedures than Phase 1 and generally observed increased preparedness among registrants. The SEC highlighted issues related to patching, execution of some of the cybersecurity procedures, and procedures that were inadequately tailored to the individual firms. Senior Investors: NASAA released a survey of 36 NASAA members regarding senior financial fraud. Per the survey, 29 percent of state regulators have seen cases or complaints of senior financial fraud increase, while 69 percent have seen no change in the past year. The survey’s release on Aug. 21, National Senior Citizens Day, follows NASAA’s release in June of a report on broker-dealer practices and procedures related to senior investors. Blass to head IM: Dalia Blass was named the new director of the SEC’s Division of Investment Management, replacing David W. Grim, who announced that he would leave the post in September. Jeffrey Harris was named director of the agency's Division of Economic and Risk Analysis (DERA). In the Atlanta Regional Office, Donna Esau was promoted to be Associate Regional Director for Examinations. Also, Chairman Jay Clayton named seven new members to his executive staff: John Cook, Jeffrey Dinwoodie, Raquel Fox, Kristina Littman, Alan Cohen, Christopher Carofine and Shelby Begany Telle. Penalties Down: According to the Wall Street Journal, FINRA, the SEC, and the CFTC have levied nearly two-thirds fewer penalties in the first six months of 2017 compared to 2016. The three regulators imposed $1.4 billion in fines in the first half of 2016, compared to $489 million in the first half of 2017. At the SEC, the figures were $750 million in 2016, compared to $318 million in 2017. Regulatory Impact Report: The SEC Division of Economic and Risk Analysis on Aug. 8 released a report to Congress describing how post-financial crisis regulatory reforms have affected access to capital and market liquidity. The report used data analysis to provide a current view of market trends and the issues influencing them. Its findings include that primary market security issuance has not decreased since the enactment of Dodd-Frank and that the Volcker Rule does not appear to have resulted in decreased liquidity. Pay-to-Play Rules for CABs: FINRA filed a proposed rule change with the SEC to apply “pay-to-play” rules to firms that are governed by the Capital Acquisition Broker rules and that engage in distribution or solicitation activities for compensation with government entities on behalf of investment advisers. Read the proposed rule change here. Inadequate Due Diligence & Advertising Substantiation: The SEC accused Navellier & Associates and its founder of misleading clients about the track record of investment strategies the firm offered. The SEC alleged that the firm performed inadequate due diligence into the AlphaSector strategy, ignoring red flags that the strategy had not performed as advertised; that the firm then distributed advertisements about the strategy’s performance track record even though it could not substantiate the performance track record; and that, when the firm realized the marketing materials could get them into legal trouble, it sold the line of business to the strategy’s model manager rather than acknowledging its errors. Extraordinary Mark-Up: FINRA announced Aug. 14 that it had expelled Hallmark Investments, Inc., in connection with a scheme to sell shares of stock at an “extraordinary mark-up.” In addition, CEO Steven Dash was barred from association with FINRA member firms, and representative Stephen Zipkin was suspended for two years and required to pay more than $18,000 in restitution. FINRA found that Hallmark, Dash and Zipkin had sold almost 40,000 shares of stock to 14 customers at $3 per share, while selling shares to other customers for as little as 80 cents per share. The difference between Hallmark’s $500 cost basis in acquiring the shares and the total sales proceeds of $122,045 represented a mark-up of more than 20,000 percent, according to FINRA. Misrepresenting AUM Fee: The SEC alleged Jeremy Drake falsely told a high-profile professional athlete and his wife that they were receiving a VIP fee of .15 or .20 percent of assets under management when in fact they paid the full 1 percent AUM fee. Drake’s clients paid $1.2 million more in fees than they would have if they actually received the VIP rates. In addition to sending false and misleading e-mails and fee reports, Drake also created the persona of “Ron Stenson” to corroborate his story. Insider Trading Scheme: The SEC and Southern District of New York charged seven individuals with insider trading in a scheme detected by the SEC Market Abuse Unit’s Analysis and Detection Center in spite of the defendants alleged use of shell companies, code words, and an encrypted, self-destructing messaging application to evade detection. Daniel Rivas, one of the seven defendants, was an IT employee at a large bank and allegedly used his access to the bank’s computer system to learn confidential information. He and those to whom he passed tips traded on market-moving news related to 30 impending corporate deals over a 2.5-year period. Improper Audit Charges: KPMG agreed to pay $6.2 million to settle charges that it had failed to properly audit the financial statements of an oil and gas company that had resulting in investors being misinformed about the energy company’s value. The failure related to the oil and gas company’s purchase of certain assets for roughly $4.5 million and subsequent decision to report those assets as valued at $480 million in their financial statements. The engagement partner in charge of the audit also agreed to settle charges against him. Read FINRA’s August report of monthly disciplinary actions here. If you have any questions, please contact your regular Greensfelder attorney or any member of our Securities & Financial Services industry group.